Everything Indoor Air Quality - Research starts here. 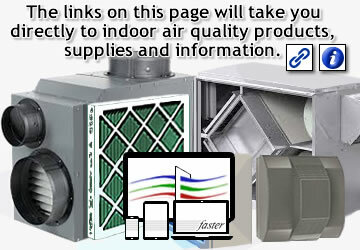 If you are looking for indoor air quality using your HVAC system, you will find it here. Indoor air quality starts with your HVAC system. With a clean indoor blower and fan unit, indoor coil and clean ducting, you will notice the change right away. Keep it that way with a good air filter or filtration device. indoor air quality (IAQ):There are many diverse definitions of the term "Indoor Air Quality". The EPA terms it as "air quality within and around buildings ... as it relates to the health and comfort of building's occupants". ASHRAE defines it as "air in which there are no known contaminants at harmful concentrations as determined by cognizant authorities and with which a substantial majority (80% or more) of the people exposed do not express dissatisfaction". A common definition would be: indoor air conditions that include humidity, temperature, air exchange and air filtration as it relates to the building's occupants' health. Other adverse effects, that affects each individual differently (hypersensitivity), would include, but not limited to; chemicals (VOCs), allergens, mold, ozone, dust/dirt, viruses, and living organisms. washable air filters:Air filters composed of a synthetic material or an aluminum, fiberglass or nylon woven mesh that can be washed with water or vacuumed and reused. Washing with water consists of spraying or hosing filter with water. A mild cleaner can be used in the process. Allow filter to dry or remove excess water by shaking out droplets and patting filter with absorbent towel. Caution: aluminum mesh can be very sharp. Some washable filters can be cleaned in a dishwasher. Check packaging instructions or with manufacturer or seller. volatile organic compounds (VOC):Compounds that become a gas at room temperature. Common sources include housekeeping and maintenance products. allergens:A substance that causes an allergic reaction. Pet dander and pollen are examples of allergens. dehumidification:To decrease moisture from the air in a space. A portable dehumidifier removes moisture and exhausts the drier air back into the same space. This accelerates the dehumidification process because the drier air is recirculated. An air conditioning system dehumidifies the air as it passes through the indoor (evaporator) coil, but at a slower rate because it transfers the heat to the outside coil (condenser). Air conditioning systems are controlled by temperature and not humidity. Spaces that tend to be constantly moist will need its own dehumidifier. antimicrobial:Applied substance that kills microbial growth. Can (but not always) be associated with a disinfectant or sanitizer. air exchanger:Defined as a Heat Recovery Ventilator (HRV) and Energy Recovery Ventilator (ERV), these systems bring in a percentage of outdoor air and exhaust a percentage of indoor air. The exchanged air is transferred to the HVAC system connected to it. In the heat mode, a HRV uses the indoor air to heat a small exchanger. The outside cold air is conditioned before entering the HVAC system. An ERV does the same as a HRV except it also acts a humidifier in the winter and a dehumidifier in the summer. The percentage of humidity it transfers depends on your climate and the amount of humidity being drawn into the system. Check with the seller or manufacturer to find out what system would be ideal for your area. micron:(also called micrometer) The millionth part of a meter. hepa filtration:(abbr. for High Efficiency Particulate Arrestance) Term for a type of filter that must remove 99.97% of contaminant particles 0.3 microns or greater that pass through it. humidifier:In HVAC terms, this is a unit that is installed on a HVAC system to increase moisture in the air. A properly installed and sized humidifier will effectively increase and maintain humidity levels during the heating season. Every unit should be controlled by a humidistat. An initial humidistat setting should be about 38%-42%. If you notice water droplets forming on your windows, the humidity level should be lowered. If the air starts getting drier, the levels needs to be raised until you find the right percentage for your comfort level. Every humidifier needs to be checked for proper operation at the beginning of each heating season. mold spores:Microscopic, multi-celled organisms that grow in an environment with a constant source of moisture. Mold spores undergo chemical reactions as they grow that cause fumes to be released. Airborne mold spores can cause severe allergic reactions and other sinus and respiratory illnesses. particles:Substances measuring less than 100 microns in diameter. ulpa filtration:(abbr. for Ultra Low Penetration Air) Term for a type of filter that must remove 99.99% of contaminant particles 0.1 microns or greater that pass through it. Everyone has different reasons for wanting cleaner indoor air. Do the research and ask the questions to see what devices will do to help. This directory has an index and terms that will guide you to a specific IAQ topic or item. This web page focuses on air cleaning and contaminant removal systems using heating and air conditioning systems. Understanding what you want to accomplish by having certain devices attached to your HVAC system is the first step in making your indoor environment healthier. Remember, a strict maintenance schedule for the entire HVAC system needs to be followed to continue to benefit from having cleaner, indoor air.